Inject your corporate away days and team building activities with a shot of adrenaline on our stand up paddle boarding experiences for business groups. Achingly cool and about as on-trend as it gets, they’ll breathe new life into your team, awaken passions and inspire blue sky thinking. Move aside raft building, paint balling and clay pigeon shooting (so 90s), there’s a new wave of corporate activities in town and stand up paddling board is pushing the limits in company cool. Combining incredible views with sleek moves and an amazing outdoor environment, SUP is super easy to learn the basics and perfect for all abilities. 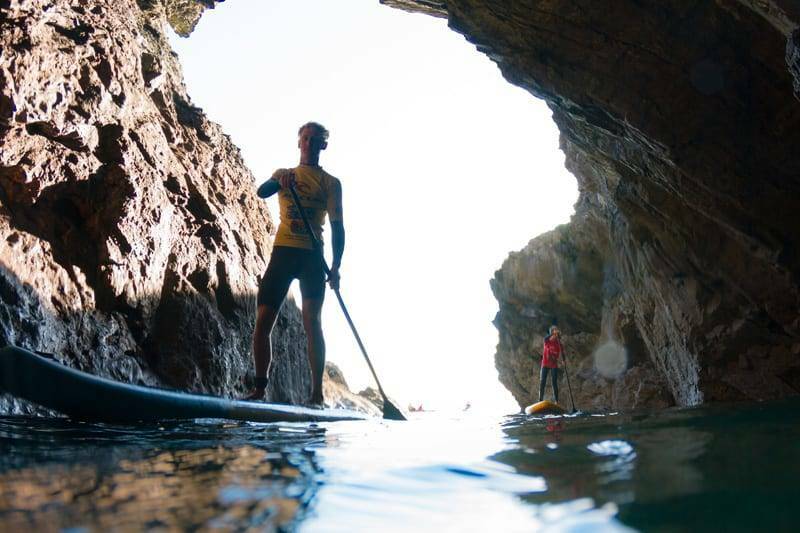 Our SUP tours are led by industry leading instructors who know Newquay’s stunning coastline like the back of their hands. After equipping your group with water safety knowhow and sharing the essential strokes and manoeuvres you’ll set off on an incredible journey where the tempo can range from exhilarating SUP adventures to relaxed sunset paddles. Whether you pick the sheltered smugglers caves of the Gazzle, the flat waters of the harbour or the open seas in the bay, you are guaranteed an experience that you’ll want to try again and again. Up for some friendly rivalry and ready to work as a team to take on your opponents? Bring it on. To fire things up we’ll throw some team games and challenges into the SUP safari. There will be tests of strength, stamina and humour with bragging rights going to whoever finishes victorious. Board meetings have never been so exciting. By the time you land back on Towan Beach you will have mastered a whole range of new skills. Time to top up your CV with new found talents in paddling and balancing. We’re mighty proud of our credentials but what’s sets us apart is our love for Newquay and the ocean. We’re fuelled by a passion that never waivers and get the ultimate buzz from sharing it with others. Our official partnership with the Armed Forces speaks volumes as does our status as a recognised provider for Outdoor Learning Programs for schools in Newquay. You’re in good hands with us!